I read Heidegger this week, so even though I tried to have deep, relevant, intellectual thoughts in response to the readings, most of the time my struggling brain could only manage connections between excerpts from the texts and sci-fi movie quotes. Luckily, I watched The Matrix last weekend, so I came into this pretty well prepared. The relationship between a computer’s physical embodiment and its meaning/ideology/logic is incredibly complex. This brings to mind lasts week’s class discussion, which started with a question about whether or not computers (and other objects) have an inherent purpose that is built into their physical form, or whether their utility is more a product of the people who use them. As much as I hate to say it, I think I’m going to have to back Heidegger on this one (assuming I understood his points correctly). According to Heidegger, assuming that technology is neutral is problematic and potentially dangerous. Heidegger argues that technology is more than a simple tool or a means to an end: “So long as we represent technology as an instrument, we remain transfixed in the will to master it, we press on past the essence of technology.” I think this ties into a point that I was starting to formulate in my last post. If we assume that technology is simply a means to an end, it follows that the best technology is the technology that helps us achieve our ends most efficiently. We begin to assume that the current state of technology is purely logical – that computers are the way they are because that’s the way they are. Further, we begin to believe that progress is the way it is because that’s just the nature of progress. And of course, in a positivist/technocratic way of thinking progress is an inescapably positive value. Within this doctrine, there is no room for questioning whether efficiency and progress are in and of themselves desirable. (This made me start to think about neoliberalism and a book called The Laws of Cool by Alan Liu.) As Habermas observes in Technology and Science as “Ideology,” the ideology inherent within technology obscures itself. Perhaps one productive way of thinking about this is to compare technology and pedagogy. In composition and rhetoric, it is widely accepted that teaching constitutes a political and ideological practice. As one of my professors brilliantly noted a few weeks ago: it might seem as if a female professor who includes female writers on her syllabus is enacting an overt political agenda in the classroom. However, what about her white male colleague who is teaching T.S Eliot and Ezra Pound? Is he not essentially teaching white male studies? The point of this anecdote was to demonstrate that teaching cannot help but be a political act. It seems safe to say that this has something to do with the act of selection; whenever an instance of selection occurs, ideology plays a role. Consider the archive: often all relevant materials can not be included in an archive. Thus, some have to be excluded. Who determines which items are included? Who determines which items are included on a syllabus? In a history book? I think the comparison between technology and pedagogy is also particularly potent here because of the fact that both are ways of teaching people how to think. As Brain Smith notes in his introduction to the “Age of Significance”, the terminologies associated with CS have become entrenched in the very way we perceive information, ourselves, and the world. It seems that technology and pedagogy can, on a simplistic level, be viewed as a way of imparting knowledge, but in reality they both shape not only the information we have access to, but the way that we access information. Anyway, if we return to the notion of technology it becomes clear that selection is also at stake. Computers are in some ways like the white male professors teaching Eliot. Their ideology is not always obvious as such. Acts of selection are occurring, even if we don’t immediately notice them. This goes back to the dichotomy between Turing’s approach and Von Neumann’s. It may be the myth of technology that the “best” technology always wins out. Thus, the development of technology is “natural” and can neatly sidestep the need to explain itself. However, this simply isn’t true. First off, who determines “best”? Secondly, assuming that politics and capitol don’t play a key role in determining the technology that wins out is beyond naive. 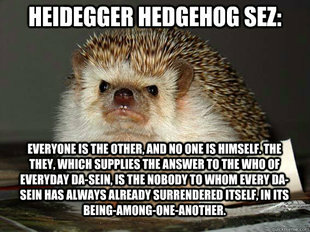 I think this is why Heidegger resonated with me. Heidegger wants to enable his readers to have a “free” relationship with technology – he wants us to become enlightened users in the sense that we can become capable of stepping back and viewing our interaction with technology from a more distanced position. I don’t think that Heidegger is saying that technology is fundamentally evil, but rather that it does embody a worldview/ideology. It has to. If we don’t acknowledge the worldview that is inherent within technology, than we cannot critique, change, or manage technology. Enjoyable post! Heidegger always makes for a frustratingly fascinating reading. I liked your pedagogical angle and its comparison to the politicization of technology. Everything has an agenda of sorts – sometimes the significance lies not in the agenda itself but the realization that that is in fact what it is. Audience and purpose serve as powerful indicators of how items should be approached and evaluated. Also, there’s a joke that there is such a thing as “white male studies;” it’s called history. your connection between technology and pedagogy in terms of their inevitable ideological orientation is absolutely fascinating, especially when you touch on the fact that they both teach us how to think. Questions of hegemony and “teachers'” authority emerge instantly in this regard. I also wonder about the current pedagogies of technology (about which I know almost nothing,) how they work, and whether students are taught to question and criticize the views of the world the computers present them with. I think the question of how we use technology is a social one. So much debate today occurs around new internet startups and how they “monetize” themselves in order to make themselves “useful.” In other words, how to technology companies bend themselves to suit the global capitalist order? Google, Facebook, MySpace, you name it… every one of them has the same question asked repeatedly. I think it possible to envision an online world dominated by research and collaboration. That _was_ the internet in its early years. But, of course, it was mostly academics then. Academics dominate the internet = cooperation. Corporations dominate the internet = competition. I guess what I’m trying to say is this: the tools allow us to do the things we want them to do.